This photograph of my mother Edna, on the right, and her friend, was taken on Brighton beach in 1940. Very shortly after this was taken, the girls joined the Women’s Land Army to engage in vital war work. Are you sure this is August 1940? I recall the beach was mined early in 1940 not long after the two piers had the middle sections cut out and you were not allowed on the lower sea front road. And all along the walks under the piers from way beyond Rottingdean and into home had barbed wire across them. This photo would have been taken in early to mid 1939 as World War II was declared in late summer and all the beaches were closed for the duration. You may be right, I do not know. 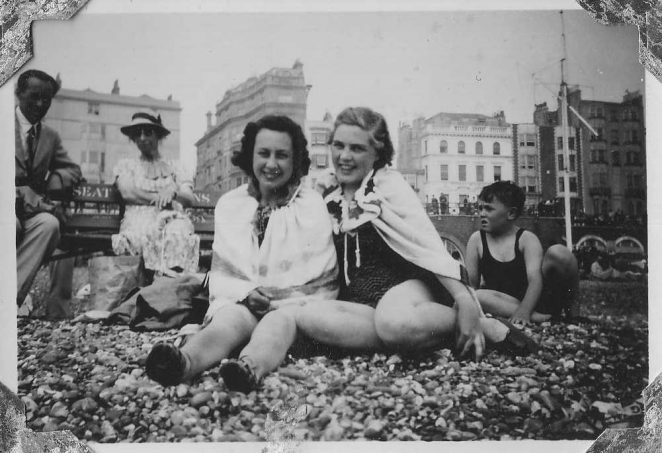 In my mother’s album it is captioned “Last day on the beach August 1940”. I believe the visit was in part because the beach was to become out of bounds. Incidentally the other lady is Marjorie Clarke from Hollingbury Rise who later married Will Baker, a well known Brighton Council Officer. By pure coincidence I have this week received a letter from Marjorie who, despite having a fall before Christmas, is back at home and recovering well (aged 90). I’m sure past members of St Matthias and others who know her will want to wish her well. According to my 1940 diary, I met my girl friend at 7.20 pm on Saturday 25th May 1940 and we walked along the seafront to the sunken gardens and then into Western Road. There was no mention of any defences at that time. However, the Dunkirk evacuation commenced two days later on the 27th May 1940, which brought the threat of invasion and there was great haste to fortify our coastliine. On the 7th June 1940 I wrote that the seafront was strongly fortified with machine gun nests and this was mentioned in my book “Brighton Diaries”. It seems therefore that Dunkirk brought about the hasty closure of the beaches including Madeira Drive and the Undercliff Walk, not forgetting the gaps made in both piers. Further mention, in my book, of the desolate beaches has also been made and on the 21st July 1940 when looking over the railings towards the sea from Marine Parade I wrote “The lower road, Madeira Drive, was now closed and the barbed wire barrier fortifying the beaches stretched all the way to Black Rock, thus the scene greeting us from Marine Parade across these beaches towards the Palace Pier was one of desolation. We had heard the beaches were now mined and that gaps had been made in the piers to delay any attempt by an invasion force to use them”. I hope this adequately sets the record straight in that this picture could not have been taken in August 1940. Ken Chambers. This link – http://en.wikipedia.org/wiki/Brighton_Blitz – gives a date 02 July 1940 at 5.00pm for closure of beach. Not known how reliable it is but seems ‘precise’. Perhaps that dates the photo “taken on last day”. I remember being taken by my aunt to see the film “The Wizard of Oz” during the war at the Astoria Cinema situated on the sea front. I would have been 4 years old 1944. I clearly remember seeing the barbed wire on the seafront side of Marine Parade as we left the cinema.